MEYERS, Tortola, VI - Officers of the Royal Virgin Islands Police Force are investigating how it is a vehicle ended up in the position it did in Meyers on the main island of Tortola today, June 14, 2016. 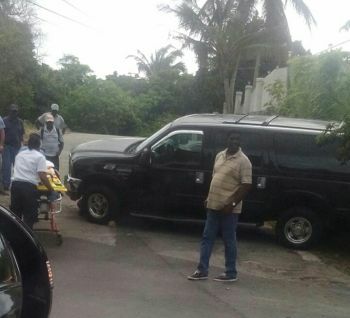 At around 4:00 pm, our news site's reporter was driving along the Joe's Hill Road in the vicinity of Meyers when the vehicle was spotted, along with the police officers. One of the officers on the scene said one person had been taken to hospital. 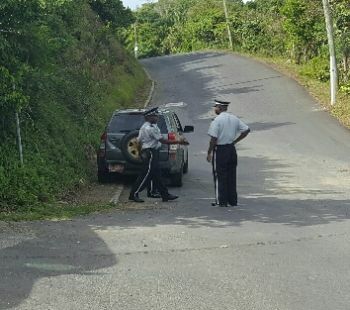 The police also confirmed that there was no other vehicle involved in the accident. 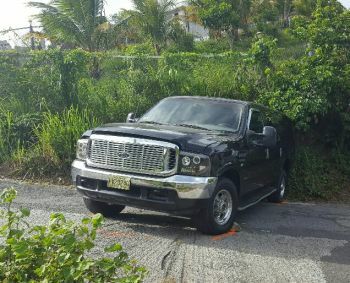 It is this news site's understanding that a mechanic was under the vehicle carrying out repairs when the vehicle slipped off the jack, pinning him underneath and dragging him some distance before coming to a stop. 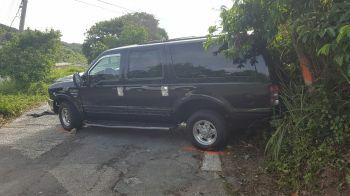 For a considerable length of time following the accident, the vehicle was situated across the road thereby impeding traffic. And, evidently no hand brake!